A 10-yard run against the Vikings on Thursday was a small moment that illustrates Michael’s progress. Michael, in his fourth season, always had ability but struggled with reliability. One run in the preseason doesn’t signify an overhaul, but it can help explain the difference between running back Christine Michael now and Christine Michael before. On the Seahawks’ first drive Thursday during their preseason game against the Vikings, Michael took a hand-off out of the shotgun formation. As he neared the line, he had a few choices: He could either bounce the run outside or over the right guard, or he could cut up the middle. Michael chose inside, squirmed through traffic and gained 10 yards. So why is that run important? Because of what it represented. Michael, in his fourth season, always had ability but struggled with reliability. The Seahawks couldn’t trust him from play to play. Would he hit the right hole? Would he pick up the blitzing linebacker? 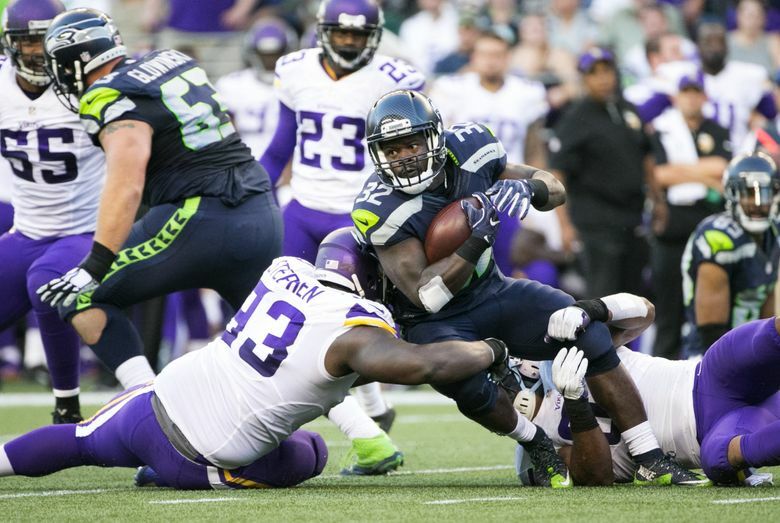 The 10-yard run against the Vikings was a small moment that illustrates Michael’s progress. “He has developed his pro eyes,” Robinson said. “He sees the second level now, so he understands where to puncture the defense. A former Seahawks offensive lineman agreed that Michael likely wouldn’t have made that run a couple years ago. Coaches and players have talked a lot about Michael’s maturity in his second stint with the Seahawks. That extends to the way he prepares, but it also extends to the way he runs. This isn’t the first time Michael has looked good in the preseason only to have it lead to little in the regular season. But he does look different. His cutback ability. Carroll said Michael has always had that tool. But Michael has looked more fluid, or at least more consistent, in picking his moments to cut back. It’s important for the way the Seahawks block. His ability as a receiver. Michael has four career receptions; two came in his three games last season with the Seahawks. That was never a part of his skill set, but in practice and in preseason games, Michael has lined up wide at receiver, and he looked pretty comfortable catching a pass out wide Thursday. His care with the football. It wasn’t long ago that Michael had fumble issues in the preseason. On Thursday, Michael switched the ball to the hand closest to the sideline during one run to better protect it. And he looked to make a concentrated effort to keep two hands on the ball while running in traffic. Those are nice and important improvements, but they won’t mean anything if Michael can’t deliver during the regular season. Michael seems to get that. “Just patience, trusting, being disciplined, focusing on the task at hand and what I’m doing,” Michael said. “Just stacking good games, stacking practices. It starts with practice, man, and stacking good practices.